There are 1,500 known species of scorpions (arachnids) in the world, and as many as 1,000 more that have not yet been identified. In North America, there are about 70 species of scorpions, most abundant in arid and semi-arid regions of the United States, but there are some species that inhabit areas of the southeast. 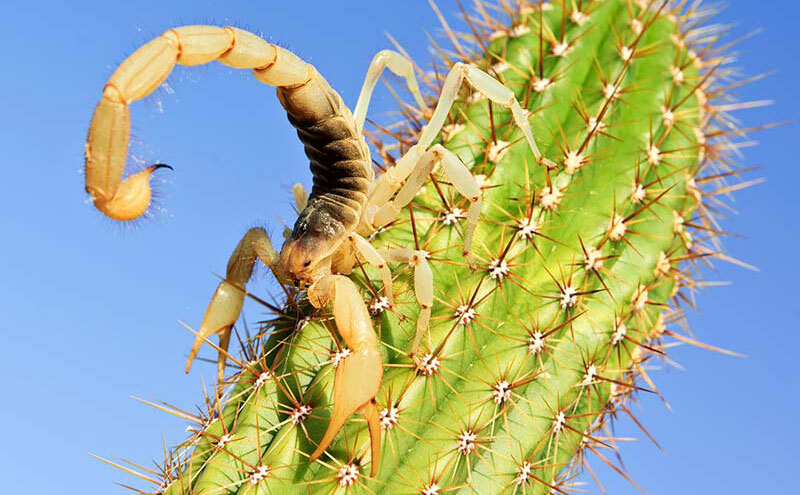 Scorpion stings can be painful — even deadly — so learn how to protect yourself, your family and your home and yard by understanding the varieties that reside in your region. Caption: Bark scorpions have life-threatening venom. Bark Scorpion. With life-threatening venom, the bark scorpion is found in desert climates, primarily in southeast Arizona, but it may also inhabit areas of California and New Mexico. These deadly scorpions are yellow and about 3 inches long. In darkness, they glow green under an ultraviolet beam. While most scorpions burrow underground during the hot daytime hours, bark scorpions are climbers that usually live above ground in tree bark and rock crevices. Because they can climb stucco and siding, bark scorpions don't shy away from homes and businesses. The Arizona hairy scorpion is the largest scorpion in the United States. Arizona Hairy Scorpion. This desert species is found in areas of Arizona and southern California. Growing in length to 7 inches long at maturity, the Arizona hairy scorpion is the largest scorpion variety in North America. This beast can be found around homes, burrowed under rocks, and sometimes get comfortable in clothes and sleeping bags. This striped tail scorpion is among the most common in the United States. Striped-Tail Scorpion. The most common scorpion in southern California and Arizona, the striped tail scorpion reaches 2 1/2 inches in length at maturity. The sting of this species is very painful, but not considered extremely harmful. The slender brown scorpion prefers tropical climates. Slender Brown Scorpion. Reaching up to 6 inches in length at maturity, the slender brown scorpion is the largest scorpion species in Florida. Contrary to its name, the slender brown scorpion can be black or red and contain bands with yellow, brown, black orange or red markings. Unlike the other scorpion species on this list, the slender brown scorpion requires a tropical habitat. While scorpions are most common in the desert southwest, they can be found scattered throughout the U.S. The only regions without scorpions are the Rocky Mountains, the north-central part of the country, and the northeastern states. Familiarize yourself with their preferred habitats and learn how to manage them in and around your home. Scorpions are nocturnal, so they spend daylight hours hiding in shaded areas, such as under rocks, in cement crevices around the home, or burrowed underground. Scorpions are most active just after dark, and can frequently be found near sources of water, such as ponds, birdbaths and leaking faucets. Because they are attracted to water, scorpions that make their way indoors are often found in bathrooms and kitchens. If you live in a region common to scorpions, take precautions to avoid stings. Wear gloves if you must reach into a dark space, always inspect shoes and clothes before wearing them, and shake out sleeping bags before crawling inside. Make your home less appealing to scorpions by caulking cracks and openings around windows and doors, and by keeping bathrooms and kitchens leak-free and dry. To kill scorpions around your home and yard, apply Amdro Quick Kill® Outdoor Insect Killer RTS (Ready-to-Spray) or Amdro Quick Kill® Outdoor Insect Killer Concentrate to your entire lawn. Scorpions are survivors — they can live up to one year with no food. With life expectancies up to 10 years, these dangerous pests can lurk in your home for a long time if you don't take action. Whether you live in a region common to the deadly bark scorpion, or in an area where scorpions are less of a threat, use Amdro® products to manage this pest and others, and protect your family and pets. Amdro Quick Kill and Amdro are registered trademarks of Central Garden & Pet Company.